Ageless Paws® Probiotic Chews are powerful dog probiotics with prebiotics that support healthy gut function. With 1 billion CFU of patented, highly stable probiotics per delicious duck-flavored chew and the added benefit of soluble prebiotic fiber, this powerful dog supplement offers advanced gastrointestinal and immune system support. It also doubles as a healthy dog treat when used according to directions below! 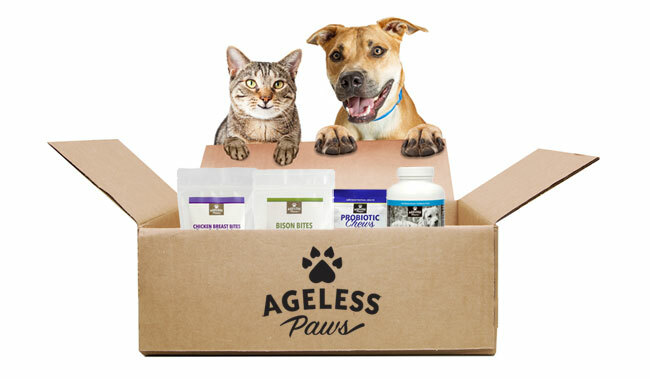 Why Ageless Paws Dog Probiotics? As a cardiologist, anti-aging physician, and certified nutrition specialist with over 25 years of experience developing nutritional supplement formulas for humans, Dr. Sinatra has developed probiotic supplements for humans, and has extensively investigated the best dog probiotics. Dr. Sinatra ultimately hand-selected this veterinarian-formulated probiotic for dogs because of its synergistic nutritional ingredients and potential to promote a healthy gut environment in canines. Additionally, as a dog lover, Dr. Sinatra knows firsthand the importance of immune and gastrointestinal and support for our beloved canine companions. We all want our dogs to live happy, healthy, long lives! Other ingredients: oat flour, rye flour, brewers dried yeast, glycerin, natural duck flavor, arabic gum, canola oil, soy lecithin, fructooligosaccharides, yeast extract, dried skim milk, dried Bacillus coagulans fermentation product, water, citrus pectin, maltodextrin, sodium alginate, calcium sulfate, sorbic acid (a preservative), propionic acid (a preservative), mixed tocopherols (a preservative).